Come Saturday it will be a dark and stormy night as Shakespeare Summerfest OC kicks off its 2014 season with a Night With the Stars. 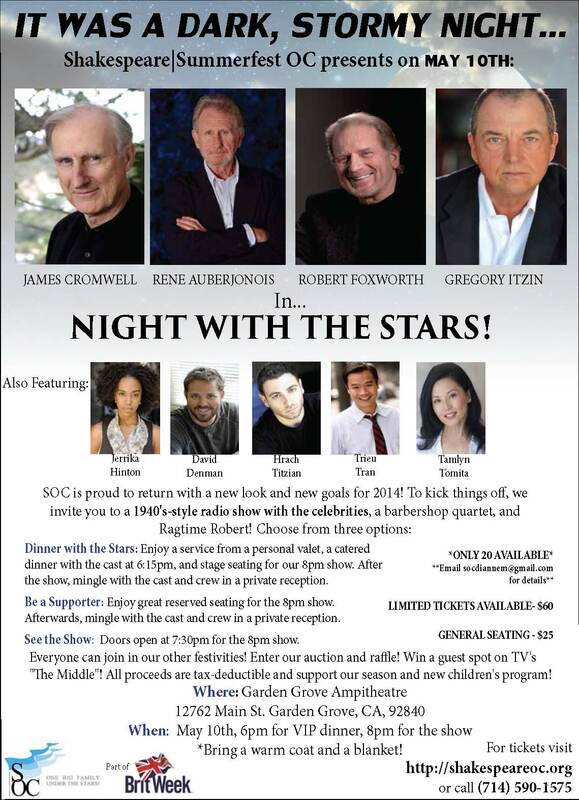 Tickets are still available for this one-night-only event which features a celebrity cast, silent auction, raffle and much more. Win an appearance on ABC TV’s The Middle or a Day Cruise for 15 on a 45 ft. Catamaran ▪ Scrubs signed by the cast of Grey’s Anatomy ▪ Tickets to South Coast Repertory, Shakespeare SOC or Chance Theater ▪ Dinner for 2 at Wyndham’s Silver Trumpet Restaurant ▪ a signed poster by artist James Dinh ▪ autographed copies of Babe and Airplane ▪ Lunch for Two at a Montage Resort Garden Party. Tickets begin at $25. After the show, meet the cast and crew during a private reception included in your ticket price ($60 Supporter Level). A limited number of premium tickets are available which also include a catered dinner with the cast before the performance and special stage seating. Call (714) 590-1575 or visit http://shakespeareoc.org for tickets.